Thank you Paul and Shou-Ching for this amazing dish and inspiration from your awesome Perfect Health Diet site. In a large soup pot, heat your favorite stock on medium heat. Add garlic, ginger, cinnamon, cloves, pepper corn, fish sauce, mushrooms and cilantro and continue to cook on medium heat. In a separate cast iron pan heat coconut oil on medium-high to high heat; add lamb ribs and cook until nicely browned and most of the fat is rendered. Once browned, add oil and ribs to soup pot and continue to cook on medium. In another pot warm a few quarts of water on high heat. Once the water is boiling add rice noodles and cook for no more than 3 minutes. Remove from boiling water, put into a strainer, and run some cool water over them to keep them from overcooking. Get your favorite soup bowl, place some of the thinly sliced raw beef in the bottom, add hot soup on top and garnish with cilantro and serano peppers. Squeeze 2 – 3 wedges of limes into your soup and through the squeezed lime into your dish. OMG, this Pho is just to die for with the browned lamb ribs added. Amazing and a must try. 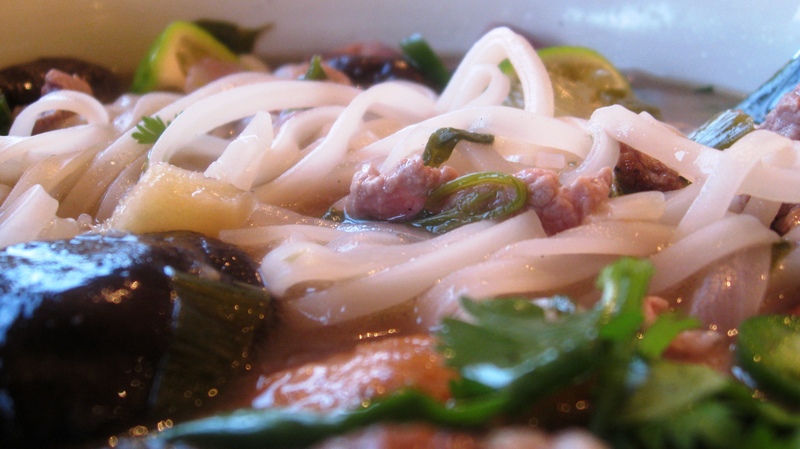 Your Pho is simply sublime! Fall begins Friday and I look forward to making this dish when there’s a chill in the air. This could be very good. Although I would change the ingredients for a beef bone stock, and beef stew just to keep it consistent meat wise. Big fan of pho by the way. thank you! Yes we have made it with beef bone broth and it is even better. I want some now….also makes a great breakfast.